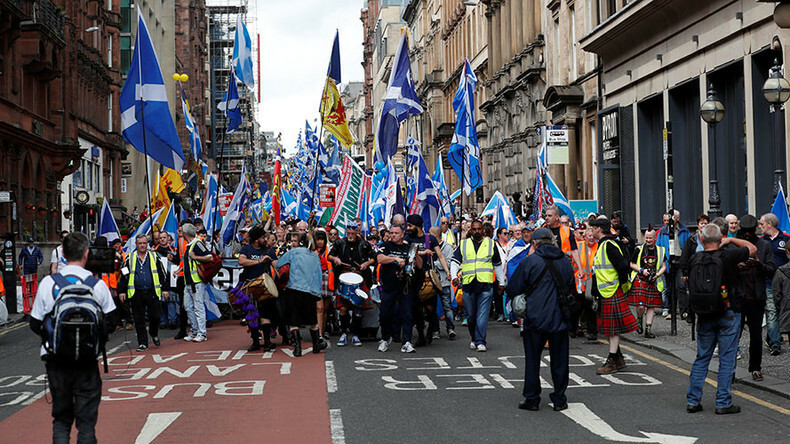 Thousands have taken to the streets of Glasgow to march for Scottish independence, as political uncertainty looms over the upcoming UK general election. According to All Under One Banner, the group which organized the march, over 17,000 people have gathered, with almost 9,000 people confirming their attendance on the event’s Facebook page. Police estimate around 15,000 attendees. The procession started from Kelvingrove Park in the city’s west end at around 10:30am, before making its way to the historic Glasgow Green park on the north bank of the River Clyde. The marchers want a second referendum on Scottish independence in light of last year’s Brexit vote, which took the UK out of the EU. In the Brexit referendum, 62 percent of Scottish voters voted to remain in the EU, compared to only 48 percent for the rest of the UK. Scottish National Party (SNP) leader Nicola Sturgeon has often argued that Scotland should be able to choose whether to stay in the EU or follow the rest of the UK. “The powers Brussels would have over us, over Scotland, would be minimal compared to the power that Westminster has over us,” one woman at the march told RT. “The European Union’s a collective of independent nations, whereas under Westminster control, we don’t really get the representation we require, and there’s a democratic deficit,” one man said. UK Prime Minister Theresa May has repeatedly said “now is not the time” for a debate about Scottish independence, which should wait until the end of the Brexit process. But a recent YouGov poll shows the possibility of a hung parliament, with the ruling Conservatives losing many of their seats to Labour, thus giving the SNP an advantage. The last Scottish independence referendum, held in 2014, saw 55 percent of the voters reject independence from the United Kingdom.